This is the precision model #490X. It is available in level 1 or level 2. 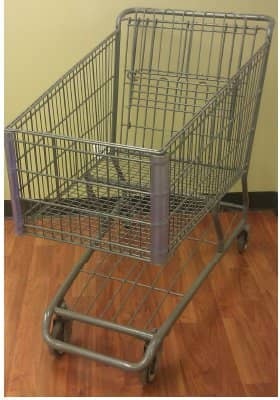 This shopping cart was manufactured by Precision Wire Product in CA but we have it in our mid-west warehouse. It has been cleaned then painted with our state of the art spray technology. Level 1 includes all new wheels, level to will have all working wheels.